Addiction is a complex issue that is so easily misunderstood! Unfortunately, the prevalence of denial around addiction contributes to the stigma associated with this condition as well people not getting the help they need. a. Symptoms of addiction: "Red flags." b. 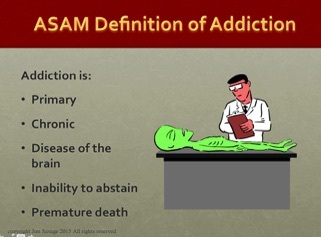 The American Society of Addiction Medicine (ASAM) defines addiction is a medically diagnosable disease of the brain that is chronic, primary, results in loss of control, and can lead to premature death. c. Denial is part of addiction. Just because someone is in denial does not mean they can’t be helped.